Schnerby sent me an adorable cuff, along with some really cool extras: a felt pin with a red button, a little felt handsewn pouch, and a postcard featuring graffiti art by Banksy. Here's the cuff being worn. 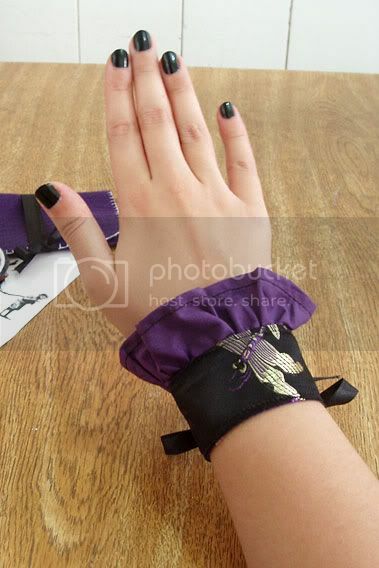 It encompasses some of my favorite stuff: the colors black and purple, ruffles, ribbons and brocade <3 I love how it looks on my wrist, I'll be wearing it a lot! The pin is just adorable! I love how thick it is with all these layers of felt, it makes the sewing lines really sink in, especially at the middle. Also, I'd like to say everyone's submissions are great, everything looks so gorgeous! Congratulations to all of you! Great package from Schnerby! I love the cuff, the colors are wonderful, and I like how it looks on your wrist too, Juliana! The pin and the pouch are really nice extras. A bird pin! LOVE birds and pins so this is PERFECT! A mini whisk with kisses - Yum! 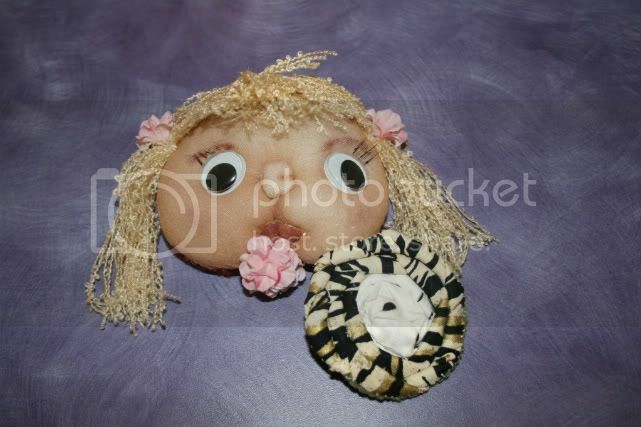 the little girl, is made out of pantyhose, how CUTE!! thanks for everything Shari, it was a blast swapping with you!! 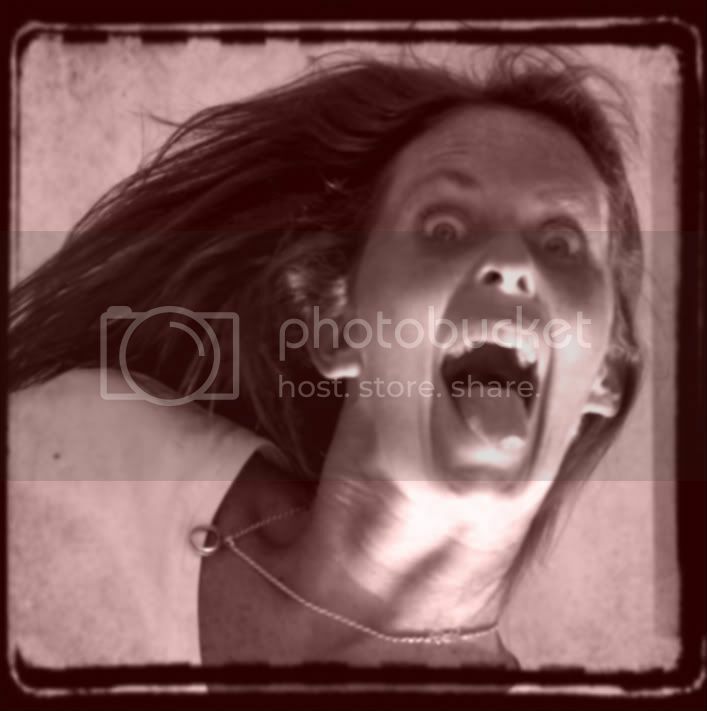 Then Smmarrt: wow! Love the heart and bird pin! The wing of the bird is cut out, right? Did you fold the rough edges inside, RhymeswOrange? Just curious, you know! Love the colours of the felt used! Beautiful, RhymeswOrange! 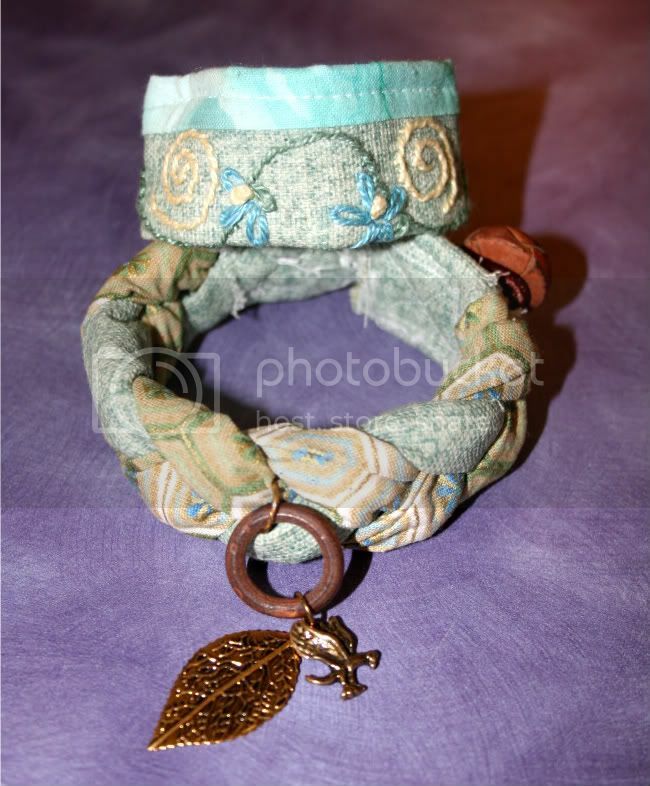 The upcycled water bottle scrappy cuff bracelet is fantastic! Did you cut a ring of the water bottle and then covered it with fabric? (I always want to know how-to, and I am just curious of course ) Like to see the other side of the cuff too... And a headband with yo-yo and two pins... I am loving it! Great job, Smmarrt! And last, but not least... OGD, you received some awesome jewellery too! Love the bracelets! And two totally different ones, even though the colours are similar! A matching pouch, two cute pins... Again that little pantyhose face, aww too cute! A lot of extras too... Sharalee you rock! WOW Awesome packages!!! OK here goes!!! "Schnerby" That's a beautifull cuff bracelet & it goes so well with your polish Juliana. The handsewn pouch is very nice & the pin is cute. Great job!! 'RhymeswOrane" Your heart & bird pins are so cute!! I love hearts & birds!! We have a bird house hanging from the roof on the back patio & we get sparrows nesting in there once or twice a year in the spring!! It's lots of fun to watch them. "Smmarrt" The recycle scrappy water bottle cuff bracelet is really cool!! I love all the flower pins espescially the zipper one. "Wendiek" Thanks so much for your sweet comments. And everybody did such a wonderful designs!! There are a lot of talented people on here!!! I have received many cool Ideas for future Swaps. "Onegroovyday" I'm so glad you like everything & & they fit. You are a great swap partner, Thanks again!! I wear my braied bracelet & ring all the time!! Also thanks to our wonderful organizers, Leslie & Susan!!! Oooh, crafty overload! Three packages posted almost at once! I love them all! RhymeswOrange, I LOVE the felt heart pin and bird (looks like reverse applique for the wing, right?). Beautiful package! Smmarrt: It's all great, but the bracelet is especially eye-catching! I love the "crafty" stamped word. Sharalee: the whole package is wonderful, especially the embroidery on one of the bracelets! Great work! I love that cuff bySchnerby—and julianapegas, your nailpolish goes great with it!! I love felt pins—this is a really great piece. Like museum of modern art. My daughter is a big Banksy fan—great postcard and great pouch to put all those crafty goodies in. great purples. Really sweet heart and bird jewelry by rhymeswithorange. Great colors on everything—I mean even your choice of THREAD! A MINI WHISK WITH KISSES!! I have got to remember this idea, I have got to remember this! 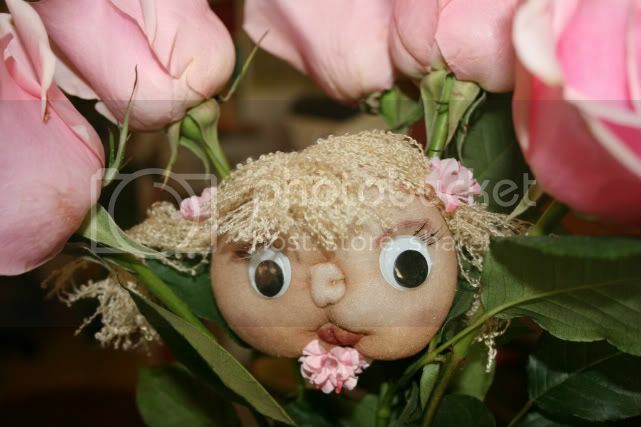 Only everybody I know would love this. Smmarrt—wow. What do you mean that it’s a recycled water bottle? That is unbelievable and I love that it says it all with “crafty”. Awesome design.. 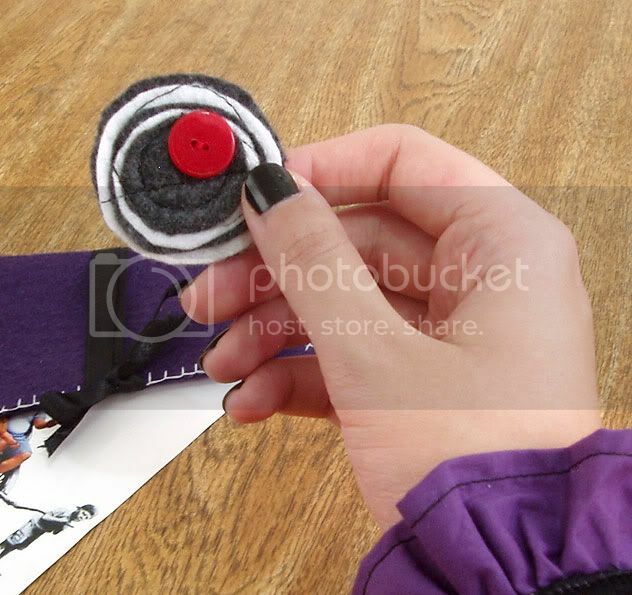 Cute yoyo headband…a zipper flower? Wow. I am seeing things tonite. And I love the flower—great that they’re different lengths, that just puts it over the top for me.Very very nice. Ooo, Sharalee! I love those bracelets. Yes,same, I love the colors and the embroidery and all of it. I love the charm on the braided one. They just have that already comfy look to them. 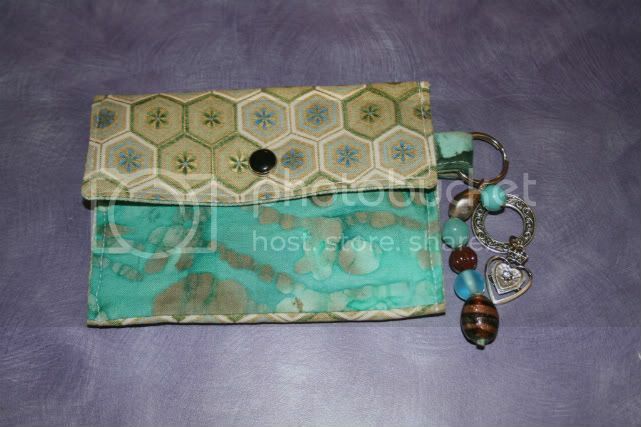 Sweet pouch and, again, great great charms just adding a perfect touch. Perfect. Oh I remember those pantyhose dolls. You are taking me BACK! There's an accompanying video on YouTube but I'm sure you can figure it out reading the instructions. I backed the scrappy part with iron-on interfacing to make the ironing and hemming easier. Next time I will sew on the machine instead of by hand. Thanks everyone. This swap should have a round 2, in the spring perhaps?